The most powerful thing you can ever do for yourself is to own your story and tell it ‘your own way and on your terms.’ Ask a journalist, who has worked hard on a story how frustrating it is when that same story is edited to take on a whole new meaning? But they soon get over it and move on to the next story, hoping that when it goes to print, it is the story they wanted to tell. It is imperative that when you tell your story, it should come from the heart with your mind, body and soul fused into it. If anyone else wants to tell your story, I am of the opinion that they should ask for your permission to do so, be it a book or film, among other art forms available to the world. After all, it is YOUR STORY! Women’s stories have been told through the lens of the male gaze in films, the eyes and words of a journalist in a news report and the words of those who claim to know the women, whose stories are being told. Yet, they would never be able to pick the same group of women out in a police line-up if they were arrested for murder. Yes, that is how well they know you. As such, it gives me great hope that there are women filmmakers, who do their best to tell the stories of themselves and other women. I am not naive to think or suggest that all women filmmakers have a homogenous mindset or approach to filmmaking. Where the African woman is concerned, a woman who has been silenced by cultural, traditional and yes, religious (though I am not a big fan of that word) dogma, it takes time for her story to come to light. Nevertheless, I must point out that there are indeed great stories about African women, past and present that must be told, are being told and we need to know, hear and see them. Our men are documented for the heroes they are but how often are our women historicised in the same manner? Recently, I interviewed the educator, Wanjiru Kamau-Rutenberg and she talked about the challenges of finding a documentary which documented great African women. That is why I am excited about the Women of Color Arts and Film (WOCAF) Festival. While it is not solely focused on African women, the festival is about bringing women filmmakers across the board, who share a passion to tell the stories of their fellow sisters. 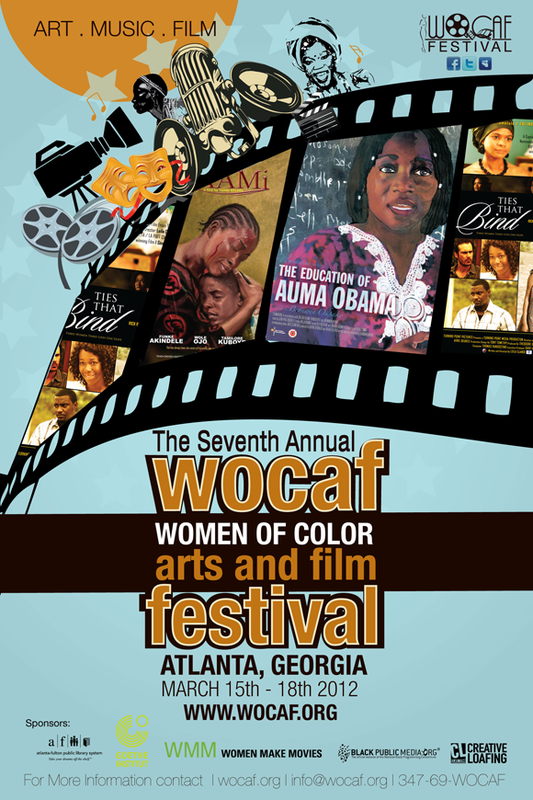 Now in its seventh year, the WOCAF Festival, Atlanta, is the only one of its kind in the southeast of the United States that exclusively presents, promotes and celebrates the artistic talents of women of colour filmmakers and artists. Each year, films and videos from across the globe by and/or about women of colour are screened. The festival which also has a musical and art platform, promotes the work of international female musicians, while the visual arts exhibition is dedicated to the work of local Atlanta women of colour artists. Founded in 2005 by Mojisola Sonoiki, WOCAF’s goal is to utilise the arts as a powerful vehicle to inform, enrich and entertain through the presentation of positive empowering images in film, music and art. This years’ opening feature film is The Education of Auma Obama by Branwen Okpako. It made its world premiere at the Toronto International Film Festival, and is an intriguing look into the life of President Barack Obama’s Kenyan half-sister Auma Obama, filmed in her homestead in Kenya during the run up to the 2008 US Presidential elections that brought her brother President Barack Obama to power. Also showing is MA’AMI by the acclaimed Nigerian filmmaker Tunde Kelani. It tells the inspiring story of a poor conscientious single mother’s struggle to raise her only child, Kashimawo, who eventually rises to international stardom in an English Premier League football club, and becomes a national hero. To concludethis year’s festival, Ties That Bind by the multi award-winning director Leila Djansi from Ghana, and described as one of the ‘hottest new wave of directors emerging from Africa, will also be screened. Ties That Bind is the story of three women from different backgrounds bound together by a common tragedy, the loss of a child. The film features Hollywood actress Kimberly Elise, Ghanaian stars, Ama K Abebrese, John Dumelo and David Dontoh and one of Nollywood’s most notable actresses, Omotola Jalade Ekeinde. Founded in 2005, WOCAF is dedicated to promoting cultural, political and social issues about women of colour. The festival’s mission is to be at the forefront of promoting the leadership capabilities of women, expand the dialogue on the social challenges that affect them and promote positive empowering images of minorities in the media. This entry was posted on Monday, March 12th, 2012 at 10:53 pm	and is filed under Africa, African Diaspora, Art and Culture, Gender, Women. You can follow any responses to this entry through the RSS 2.0 feed. You can leave a response, or trackback from your own site.